HOW TO WIN IN CASINO? Here we are with another premiere from great NetEnt. The Legend of Shangri La – Cluster Pays will be launched within next 7 days. To make sure you are well prepared for the premiere I have prepared a review for you. So come on, and join me on a trip to the cherry blossom land where you can enjoy some really nice winnings. First of all – you will not find normal pay lines in here. 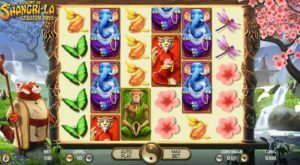 The Legend of Shangri La works exactly like Aloha slot. Winning will be granted once you will hit a cluster win. To hit it, you will need to have 9 or more same symbols in a cluster. The game is, of course, available on desktop and mobile devices. You can play it on the go or at home – as you prefer. The Legend of Shangri La comes with some extra features. We will have standard wild symbols in here (called substitutions). Then, you can get random substitutions, it will be activated as you probably already figured out – randomly. You will get when you will hit at least two clusters of the same symbol. Then you can be sure you will get at least one substitution symbol and more will be added randomly until a winning cluster is composed. So, you can be sure you will get some win in here! Next thing you should know very well – it’s Sticky Re-spins! Yes, exactly the same thing that you could see in the Aloha Cluster Pays slot. If you will get 2 non-winning clusters of the same symbols, anywhere on the reels, then you might get it. The reels will spin until you will keep getting your symbols. No win can be guaranteed in here, but I usually get some pretty nice ones in here. Now let’s move on to the next one – Free Spins game rounds. Not so many to be honest, especially when you are used to getting at least 10 or more free spins. In here maximum that you can get is 8. For a standard hit of 3 scatters you will get 5 free spins, then one extra for additional scatter, until 8 as mentioned above. The nice thing in here is, that if you will hit 2 symbols and another one will land on the right just outside of the visible reel area, then the third symbol will be nudged back to give you some free spins! This feature is called Nudge Reel, and you may see it quite often. During the free spins, you will get some random substitution symbols. First of all, you will get two of them and after each spin, you can have between 2 and 6 symbols added to the reels. Some symbols can be also removed before the next spin begins, it can be from 1 to 4. If you weren’t lucky enough during the free spins and your total win is less than 10 times your bet, then you might get an additional spin. But, let me mention the best thing now! You can try this awesome new slot as soon as it’s launched with 20 free spins without a deposit. Follow the button below and start playing The Legend of Shangri La for free. How to play in Casino? The best casino games with lowest stake! Copyright © 2019 FreeSpinsInCasino.com. Theme: Himalayas by ThemeGrill. Powered by WordPress.